Aristarchus of Samos (ca. 310-230 B.C. ), called “the mathematician” during his life, is the first person known to have proposed our modern view of the universe: that the Earth revolves around a fixed Sun. For some reason, however, Copernicus, who wrote 1700 years later and knew of Aristarchus’ work, is the person most often credited with this heliocentric theory. Being far ahead of his time, like his younger contemporary Archimedes, his ideas never seem to have developed a following and so died out until the telescope revived them. Unfortunately, the original work in which Aristarchus proposes the theory has been lost; we know of it because Archimedes refers to it and describes Aristarchus’ proposals. Unlike some ancient scholars, whose seemingly modern views were part of a larger system of mysticism and religion, Aristarchus was firmly grounded in observation and mathematics. The heliocentric theory is thought by some to have been a natural exension of his finding that the Sun is much larger than the Earth. His major extant work, On the Sizes and Distances of the Sun and Moon, consists mainly of meticulous geometric proofs of this and the other hypotheses which he proposes. He describes a spherical Moon, illuminated by the Sun, and much closer to the Earth than the Sun is, a very accurate world-view for the third century B.C. His results were only limited by the accuracy of the measurements of his day, which suffered from a lack of technology. Interestingly, Aristarchus was preceded by Heraclides of Pontus (ca. 388-315 B.C. ), who proposed that the motions of Mercury and Venus were due to the fact that they revolved around the Sun, while the latter revolves around the Earth. A successor to Copernicus, Tycho Brahe, made a similar proposal in the 16th century. Furthermore, Archimedes proceeded to work out a rudimentary form of calculus, which Newton and Leibniz would develop much more fully in the 17th century to explain Copernicus’ system. The following two pages contain excerpts from the original Greek texts of On the Sizes and Distances of the Sun and Moon, and Archimedes’ Sand Reckoner, in which he describes Archimedes’ heliocentric theory (which, incidentally, he says is impossible!) As an exercise, I have included word lists and literal translations so you can follow along. Conventional translations can be found in the book by Sir Thomas Heath, Aristarchus of Samos: The Ancient Copernicus Oxford: The Clarendon Press, 1913. This book contains a detailed description of Greek astronomy in general, as well as a summary of Aristarchus’ life and work, and the complete Greek text and translation of On the Sizes and Distances of the Sun and Moon. Aristarchus in Astronomy 201, Cornell University. Aristarchus of Samos, Heraclides of Pontus, and Greek number systems at the University of St. Andrews, Scotland. 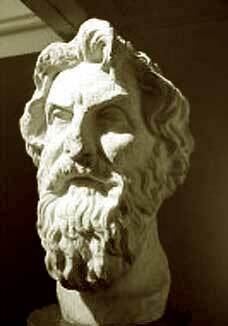 Aristarchus of Samos by Kristen Riley at the Perseus Digital Library.